High fashion in the world of petunias! 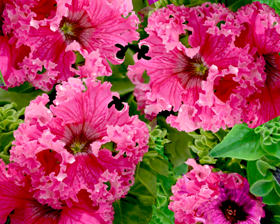 Charming candy-pink, havy frilled petunia flowers 10cm across are perfectly suited to bedding and borders. With great weather resistance, Petunia ‘Frillytunia Butterfly’ won’t spoil with early summer rains so you can enjoy their frills throughout summer. Height: 30cm. Spread: 35cm. Sow Frillytunia seeds late winter to mid spring at 21-27C on the surface of a good seed compost and gently firm down compost. Keep soil damp but not wet. Do not exclude light, sealing in a polythene bag after sowing is helpful. Germination usually takes 10-21 days.